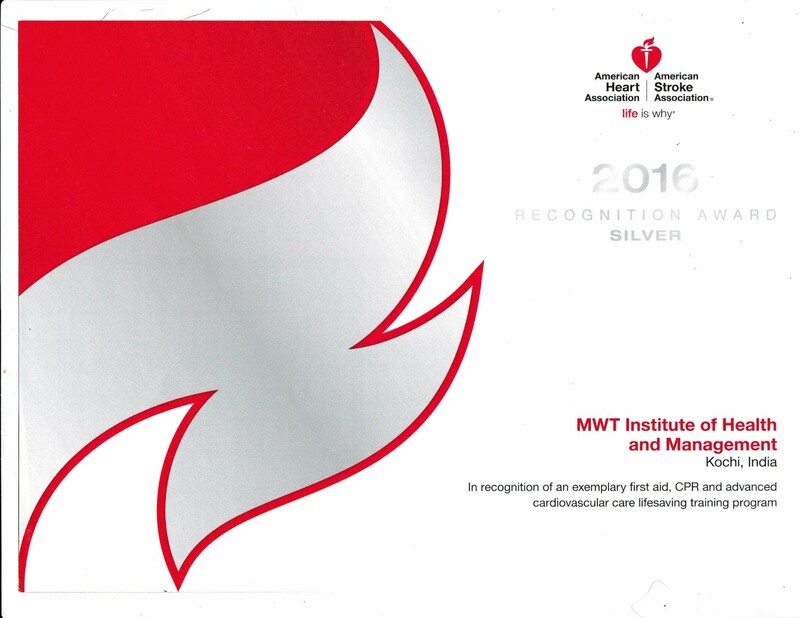 Silver Merit Award for HCI From American Heart Association! It gives us great pleasure to announce that Health Careers Institute, Kochi (Formerly MWT Institute of Health and Management, Kochi) has secured the prestigious Silver Merit Award from the American Heart Association for the year 2015 – 2016. The American Heart Association Emergency Cardiovascular Care Recognition Program was created to celebrate this commitment to saving lives and to recognize International Training Centers who deliver quality training with a significant or meaningful impact. This is the second time in a row that we have been honored with the award for our perseverance in delivering value based quality education and standardized training in the AHA accredited courses. The American Heart Association (AHA) is a non-profit organization that is headquartered in Dallas, Texas in the United States. The American Heart Association is a national voluntary health agency and works worldwide to foster appropriate cardiac care in an effort to reduce disability and deaths caused by cardiovascular disease and stroke. AHA recognises the work done by training institutes across the world, day in and day out, to deliver quality lifesaving training to their communities. They believe that the effort put in to impart quality training creates a ripple effect that will improve systems of care, strengthen the chain of survival, improve safety and save more lives. Health Careers Institute, Kochi, has been offering AHA’s ACLS (Advanced Cardiac Life Support) and BLS (Basic Life Support) classes in various venues across the country. Let us all join hands to expand the reach of our training, as we continue to strictly follow AHA guidelines that help ensure quality program delivery, and support each other as we work together to help save lives.